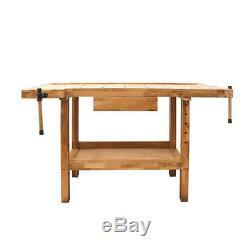 DJM 01421 Oak Wooden Work Bench with Vices. A modern version of a traditional woodworking bench. This bench is constructed from quality oak much harder wearing than standard softwood benches. Environmentally friendly manufactured from 100% sustainable forests Bench incorporates 2 oak vices. 4 work piece holding pegs Single central. Waist level drawer convenient tool storage. Low level, full length storage for bulkier items. Timothy Wood Limited is one of the longest established hardware stores in the country. Established in 1926 by Timothy Wood, the company started out supplying the vast textile era on the early nineteenth century through today the company has three aims, Service , Value and Fairness. Trade counter situated next to the football stadium in Huddersfield West Yorkshire. Timothy Wood Limited is a family run business and offers a more personal service than national companies, going that one step further to meet all our customer expectations. We supply a wide range of hardware, ironmongery, fixings, sealants, power & machine tools, ladders and more sourced from trusted manufactures to obtain the best products at great prices. We have been trading successfully online since 2004 and have built a good relationship with customers within the United Kingdom and beyond. The website is maintained by Jay and Dean two family members who are the new generation of Timothy Wood Limited , with long experience of the Architectural Ironmongery, Power/Hand Tools and Engineering products backed by staff who have been with the company since the 1960s. This all makes Timothy Wood Limited your ONE STOP SHOP for all your needs; please review our web site and thank you reading the above. In order to receive this, your item must be paid for before 2.30pm that day. Although we dispatch the goods on a 24 hour service, it is not always guaranteed. Our couriers will be leave goods on site without some form of signature. If damaged goods are not signed for damaged, it will be your responsibility to return them at your own cost. If you are carded twice, the goods will then be sent back to ourselves. Our carrier will charge us for trying to deliver the goods and then charge us for returning the goods. This charge will be passed onto you. Deliveries to the following post codes. Deliveries to Southern Ireland will require an additional charge which needs requesting before purchasing. However, should you require to return any product, we will allow you to do so within 30 days of the day after receipt. You will have to arrange the return of the goods yourself and track them using a reputable carrier at your own expense. Returning an item that is faulty within the first 30 days of receipt. We will arrange the uplift of the goods on a day convenient for you (Monday to Friday). Returning an item that we have supplied incorrectly. If we have supplied an item incorrectly we need to be notified within 30 days of receipt. We will arrange the uplift of the goods and have the correct item sent out at the same time on a day convenient for you (Monday to Friday). Although this will be arranged on the same day, it is not guaranteed the collection driver will be the same driver delivering the goods. Our members of staff are always happy to help. The item "New Work Bench Table Solid Oak Strong Premium Heavy Duty Workshop Bench & Vices" is in sale since Tuesday, September 26, 2017. This item is in the category "Business, Office & Industrial\Manufacturing & Woodworking\Woodworking". The seller is "timothy_wood_ltd" and is located in Huddersfield, West Yorkshire. This item can be shipped to United Kingdom.